Our readers sometimes drop me a personal email and beg me to find them new ways to lose weight and get on a healthy diet. Well, here's a wonderful new diet item to add to your weight loss battle plan. It's crunchy and tastes like sesame seeds. And it's so simple to use. No pills to pop that make you shaky all over. No powder mixes that taste chalky, either. It's called FitFlax by SmartThingz ($12.95, http://www.smartthingz.com/). It's been written up in magazines like O, and weight loss experts have given it the thumbs up, too. What we like about FitFlax---it's a food. You can eat it. And it tastes delicious. Try it on peanut butter and crackers. And it's gluten-free. Our proprietary blend & unique roasting process promotes weight loss, energy & wellness. 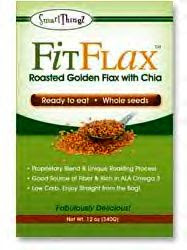 FitFlax™ delivers greater Omega-3, protein, fiber and antioxidants than conventional flax products. No more grinding! Enjoy healthy FitFlax™ straight from the bag! Our special roasting process enhances both the quality and the natural nutty taste of the seeds. Toss it on salad, mix it in yogurt, sprinkle it on practically anything to add taste, texture and fiber! Now, that's a pretty decent list of why you should try FitFlax, as you crunch your way to skinny.